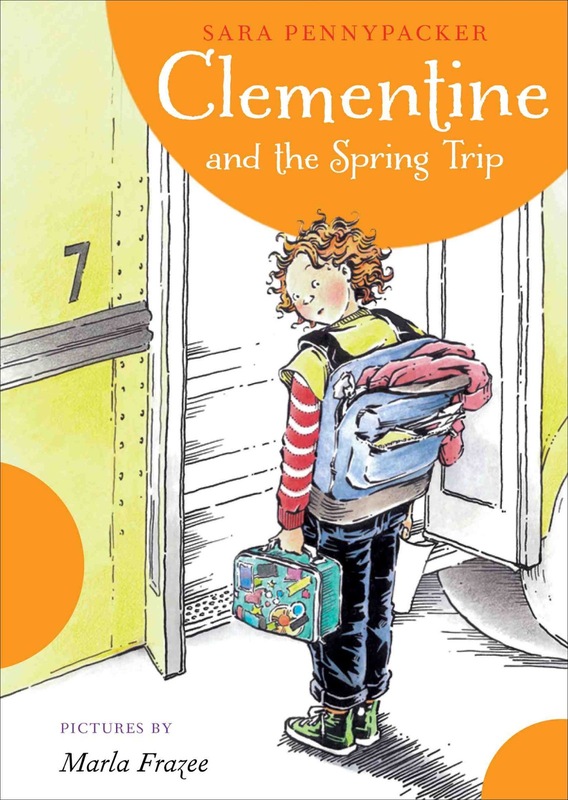 I am extremely excited to be participating in the blog tour for CLEMENTINE AND THE SPRING TRIP by Sara Pennypacker and illustrated by Marla Frazee. I read this book earlier in the week and thought it was adorable! 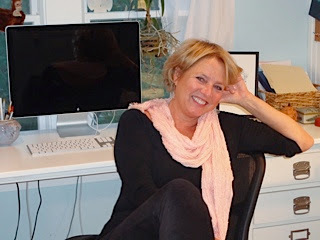 Today, the author behind the wonderful Clementine series, Sara Pennypacker, is stopping by with an equally fantastic guest post! Hi Julie, and thanks for having me. I would have loved a resource like this when I was raising, and reading with, my kids, but I’ve already found plenty of good reading suggestions for me here, too. This is my final stop on the blog tour for my sixth Clementine book, and I have to say, it’s a whole lot easier than a physical book tour: I can do it in my pajamas, there’s no air travel torture, and no panicky awakenings in the middle of the night wondering where you are. In fact, there’s only one thing I miss: room service...I admit it, I adore room service. Still, I have to say I love travel. And I’ve been thinking about it a lot as I’ve been doing this travel-free tour for a book built around a trip. I think travel is especially important for authors. It’s our job to tell stories that reflect human experience, and unless we get out there and encounter a lot of different human experiences, we’re not drawing from the fullest material. Authors are naturally introverts, but it’s worth it for us to connect with lots of people who aren’t, well... other introvert authors. It’s also rejuvenating. Writing a book is like wringing the sponge – everything’s going out of you onto the paper, and there’s not much going in when you’re deep in the weeds with a manuscript. You spend all those months essentially living two lives: your own and your character’s. Since the latter’s is intensely colored and emotionally charged, the writer ends up drained afterward. So after I finish a book, I try to spend time in a colorful and exotic (well, to me, anyway) location, to fill up on new sights and sounds and smells and tastes. For some reason, the fifth Clementine book, CLEMENTINE AND THE FAMILY MEETING, was a push right up until the deadline. I had booked myself a trip to Mexico with a friend to recuperate afterward, and I believe I actually sent the manuscript in only hours before my flight. I am told that after landing in Oaxaca and checking into my casita, I slept for nearly two full days, with only a couple of staggers into the bathroom. But afterward...! I felt like I was swallowing the birds and flowers and street music, right along with the moles and the guava juice. But maybe the best reason for me to travel as a writer is that the ideas for books so often come from trips. Clementine is home-grown in Massachusetts, but many of my other books have had their seeds sown in trips away. I wrote the bones of my picture book SPARROW GIRL after a visit to California where I spoke to a man who was a child during Mao Tse-tung’s Sparrow War, and I’m currently writing a novel that was sparked by a conversation with a school librarian in Oklahoma about animals in wartime. There’s something about being in a strange place that wakes you to possibility, I guess. Or maybe it’s that you’re more vulnerable when you’re in unfamiliar surroundings – maybe without the safe cloak of the familiar, you simply feel things more. That’s how it was for Clementine on her Spring Field Trip, anyway. Clementine’s world is very safe – I’m writing about a delightful (but okay fine, challenging) girl here, who has the support of functional, caring adults in her family and school. In this sixth book, I decided to challenge her a little by taking her out of her safe environment and by testing her sense of fairness. 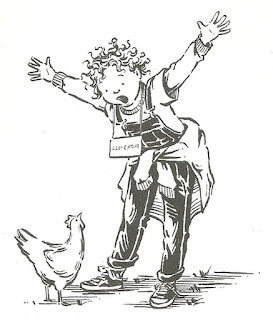 While with her class at Plimoth Plantation, Clementine encounters a chicken, and can no longer hide from the unpleasant truth that people eat animals. Ack! This sounds so serious! Of course, mostly this book, like travel, is about fun. Sara Pennypacker was a painter before becoming a writer, and has two absolutely fabulous children who are now grown. She has written several books, including the Clementine series, all illustrated by Marla Frazee, The Amazing World of Stuart, Sparrow Girl, and Summer of the Gypsy Moths. She grew up in Massachusetts and splits her time between Cape Cod and Florida. Giveaway alert: I have a copy of CLEMENTINE AND THE SPRING TRIP to share with one lucky reader. To enter, just fill out the form below before Friday, July 5th at 11:59 p.m. EST. I will randomly select and notify the winner the following day. This contest is open to those of you with U.S. addresses only. Good luck! I never thought about the connection between travel and getting the creative writing juices flowing. Great guest post. Wow, she gets the most out of her trips! I bet traveling with her would be a lot of fun! I can see where traveling would inspire and excite authors. Great post, thanks!